One day ride, El Toyo, just over 1 hour's drive from Santiago, Chile. The most popular one day ride goes out from our parcela in El Toyo, just over an hour’s drive from Santiago. It winds up through native Chilean trees and follows along the top edge of a river valley, passing cactus and chagual flowers perched on craggy rocks, with pools and waterfalls below. We stop for lunch near the river where there are pools to cool off in summer, and then come down again afterwards, often surprised at the sure-footedness of the horses. In summer we can also ride and camp in the high cordillera of the Andes, going out from Banos Morales. These rides are more remote and for that reason more costly, as is the transport to get there, but for many people it is worth the extra expense. I am interested in the one day ride for Sunday 9/11. Do you offer the rides Sunday? If so, what is the cost and if we are staying in Santiago how do we get to and from the location for the ride. We take rides every day of the week so Sunday is no problem, although weekends get more booked up than weekdays. 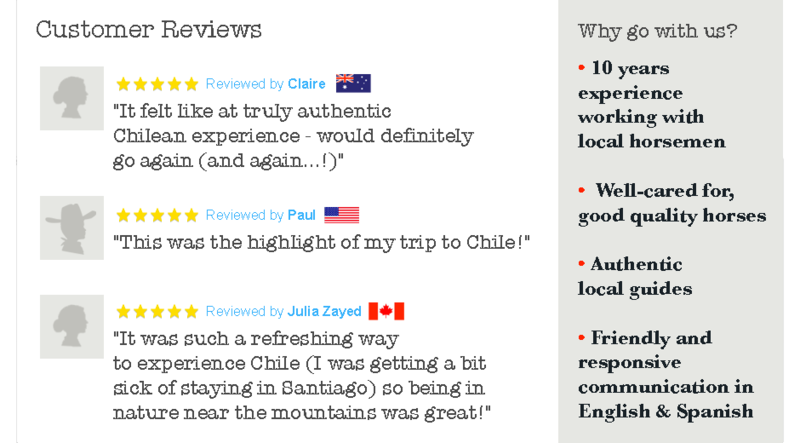 We can fetch you from Santiago for an extra cost, or tell you how to get here by public transport if you prefer. I am planning on being in Santiago in late April 2012 and wanted to know the timing for the day rides. If I was staying in Santiago what time would I need to leave the city and what is the best way to get to the location of the start of the ride? And what time could I expect to be back in the city afterwards? nearer 2 hours. You could expect to be back in Santiago around 6 pm. I am interested in a tour horsebackriding the day before or after christmas. Is it possible to make an reservation? What would the cost be in dollar for two persons ? We are pretty good riders even thoug it has been a few years sence last time. Jude here from Australia again. Well my travel plans for next year are nearly all locked in now and I wanted to book in for a day trip riding with you on Wednesday 25th of April 2012. And ask that you collect me from the Hotel Boutique de Patio in Santiago. Can you also confirm what I will need to bring for the day and what the cost of the riding and transport will be? Hi, good to hear from you again. April is a good month to ride in the Andes here – still warm enough to bathe usually but not quite so hot as midsummer. The leaves start to turn and it all looks wonderful. I’ll book that day for you and send you the details of cost and what to bring (not much more than sunblock and sunglasses plus strong shoes) by email. hi, i want to know if it’s possible to do the one day ride next tuesday 20/12/2011? and i’m in santiago so i want to know how to come by public transports? Hi How are you? I am an expat here in Chile (been here 2 months so far). I don’t yet have a vehicle, so I was wondering what your price for pickup would be to Los Codes? Thank you. We would love to take you for a ride and winter is as good as or better than summer. Pickup, transfer both ways,from Las Condes costs 40,000 CLP but it is possible to get here by public transport (your cost around 3,000 each way), or half metro half pickup (Cost on metro 1,200 and transport round trip 15,000. This is the easiest). Let’s talk further! Hello there. I would be very interested in doing the one day ride with you on either of the following dates 7th, 8th or 9th of October 2012. I will be on my own but would love to ride within a group of people. My horse riding experience is to all intents and purposes zero. Please could you tell me if you have any vacancies for any of those dates. I will be staying at a B and B in the Providencia area of Santiago and I would enjoy getting to the meeting place under my own steam. Please can you tell me how to do that and what time I would have to leave to make sure I arrived on time. Please also could you let me know the cost for this, and should I wear or bring any particular item of clothing with me, I assume a hat of some sort is essential. Many thanks and I look forward to your response. I am interested in a One Day Ride this Sunday 19th August. Do you still have any spaces left? Because I am really keen and I´m not in Santiago for much longer! What are directions to the start of the ride using public transport and when will I need to leave Santiago by in the morning? We will be in chile In early November but don’t have time to spend 5 hours. Can you do shorter rides? Hello, I am sorry not to hve answered sooner – I have been in the UK and somehow your message didnot get through to me and I have just found it. The answer is, yes, we can do rides of whatever length you wish. Probably needs to be at least 2 hours to get anywhere much but it is very beautiful all around where we ride in the mountains. The price is 15,000 Chilean pesos per hour per person if there are more than one – or 20,000 for just one person. Minimum payment is 20,000. Please let me know if you are still interested and also how much time you have available. You do have to get to us – we can pick you up from Santiago for 40,000 round trip and the journey takes about an hour & 10 minutes. I was wondering if it’s possible to take a one-day ride next thursday on the 20th of September. If it is, how do I get there and what is the cost? And also, what clothes should I bring?